A photo from earlier this fall shows the former Pan and Fork property in Basalt. The land to the left is a park owned by the town. A development firm is working on a plan for the private property within the black fence. 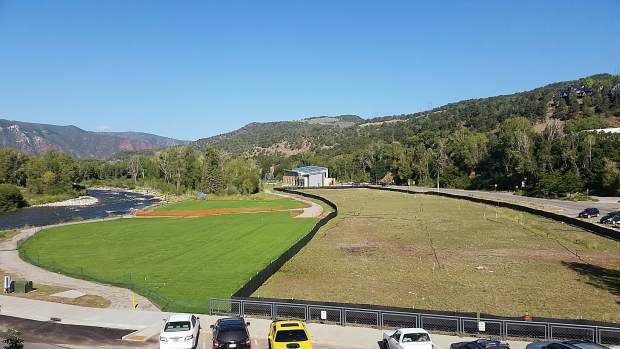 A developer working on a plan for the former Pan and Fork site in Basalt reduced the number of free-market units and created “micro-housing” and rental apartments to try to sweeten the pot for the Town Council. Basalt River Park LLC, headed by midvalley businessman Tim Belinski, refined its plan to include 14 micro-housing units of about 500 square feet each. The idea is the small size will keep the studio and one-bedroom units affordable. Another 10 units of rental apartments would be provided in two buildings with one-, two- and three-bedroom units. The size would average 1,000 square feet. A final residential component would be the moneymaker. Belinski and company proposed 12 free-market “river cabins” of as much as 1,600 square feet. Belinski and his team’s architect, Rich Carr, floated the plan by the council to gauge reaction before formally reworking its application. The old plan, which featured 22 free-market sales units of as large as 2,400 square feet, was widely criticized by the council earlier this year. The council didn’t vote because the meeting was intended to be an informal discussion to try to make progress on a process that’s been bogged down for years involving different plans by various developers. The meeting was designed as a way for the council to provide input on the direction. “You started to hit the boxes that I think are important when we address our overall objectives,” Councilman Bill Infante said. Other council members expressed concerns about certain components of the plan. “I think there’s way too much housing still,” Mayor Jacque Whitsitt said. “If we’re going to make something happen here, we’re all going to have to make compromises,” Councilman Auden Schendler said. “I know not everybody likes the housing, but I really like the idea of micro-housing,” he added. Creating vitality depends on placing people on the site, he said. The plan’s two centerpieces remain open space on the eastern end, closest to the intersection of Two Rivers Road and Midland Avenue, along with a community building. The town is pondering the purchase of up to an acre of the 2.3-acre site that Belinski’s group has an option to purchase. The town would add the acre to the existing, adjacent Basalt River Park. The town’s proposed budget for 2019 includes $1.6 million from various sources to purchase 1 acre for addition to a park. In addition, the council majority insisted three weeks ago that the developer incorporate the community building into the plan. Town officials will consider buying and operating it as a place that would be rented for weddings and host community events. The community building would overlook the open space and provide easy interaction with the park. “It’s a spectacular location,” Carr said. The community building would also incorporate a shared food space and bar area. Infante objected to the concept of the town government buying and operating a community building. The private sector is better at heading such operations, plus such a facility would compete with other established entities, he said. “The notion of having a town-owned wedding space, I don’t see the logic of that,” Infante said. The proposal retains space for the ArtBase, a community arts center, but it is pared down from Belinski’s original plan. It would be about 7,000 square feet, with a 5,000-square-foot footprint. Additional commercial space, probably nonprofit offices, would be mixed in with some of the housing buildings. Councilwoman Katie Schwoerer said the apartments and micro-housing must be affordable. She noted that a 38-unit mobile home park used to exist on the site. The town helped relocate the residents for fear of flood danger at the site. The town also spent funds to raise a portion of the site out of the flood plain. “The backbone of our community that used to live here is not going to be able to live here” in the future, Schwoerer said. The next step will be for Belinski’s team to refine its application and provide details for the council to review. The next meeting will be scheduled in late November or early December, according to Town Manager Ryan Mahoney. “We fully intend to take public comment. We think that’s important,” he said.